Shotgun is a short film about semi-professional assassins Doyle and Abby who embark on a brand new "hit" adventure. What should be a quick job turns into a fight for their lives when Doyle's ill-timed bathroom break flushes their plans for easy money straight down the toilet. Kiss kiss, bang bang!!! In a world where assassination is legal, two not-so-super assassins, Abby and Doyle, try to ply their trade. This is the world of Riding Shotgun, one crafted in equal parts from hardboiled pulp fiction, saucy double-entendre, and black comedy. 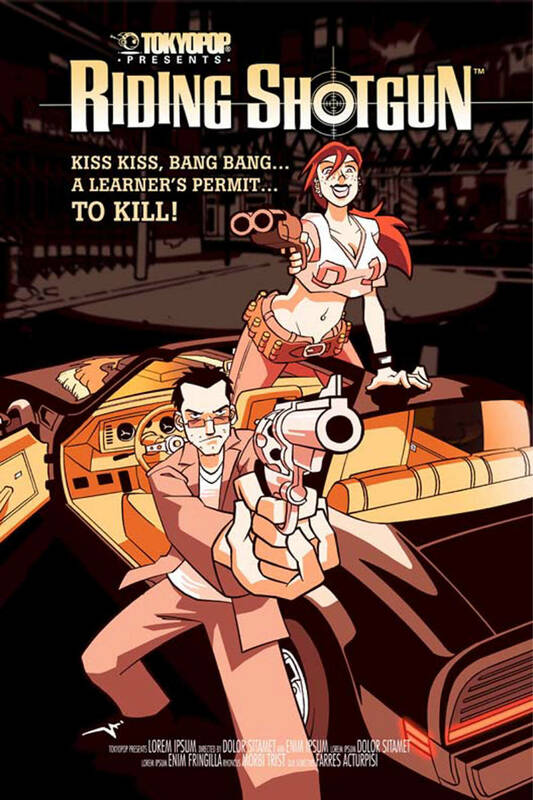 Riding Shotgun started out as a Global Manga graphic novel written by Nate Bowden and drawn by Tracy Yardley for TOKYOPOP in 2006. Two volumes were released at that point. TOKYOPOP did a Manga Motion Comic for MySpace.Com, and the shorts are still available on YouTube and Hulu. Riding Shotgun is now tearing up YouTube once again as a short produced by TOKYOPOP, animated by Copernicus Studios, and written and directed by animation and live-action director Michael Davis. (Shoot ‘Em Up) In the space of two weeks, this short has racked up in excess of 600,000 views! Thanks to Mondo Media for helping us with the rollout! We have tremendous voice talent who helped bring the new short to life. Yuri Lowenthal, the voice of Doyle, is a longtime part of the TOKYOPOP fam, as the star of the film inspired by our manga Van Von Hunter. Lowenthal is also very familiar to anime and game fans, as he has had high profile roles in English localizations of Otaku favorites like Naruto and Final Fantasy. Jessy Schram, who plays Abby, is a top flight actress who has primarily worked in American TV on shows like House, MD and Once Upon A Time. PopStix! is a countdown show based on Asian pop culture, with each episode featuring some of the best YouTube has to offer. Motion comics based on manga comics including Riding Shotgun, Gyakushu!, Bizenghast, Princess Ai and I Luv Halloween.